Former California Gov. Jerry Brown called out politicians for “sleepwalking” on increasing nuclear and climate change threats Thursday during his first public appearance as executive chairman of the Bulletin of Atomic Scientists. 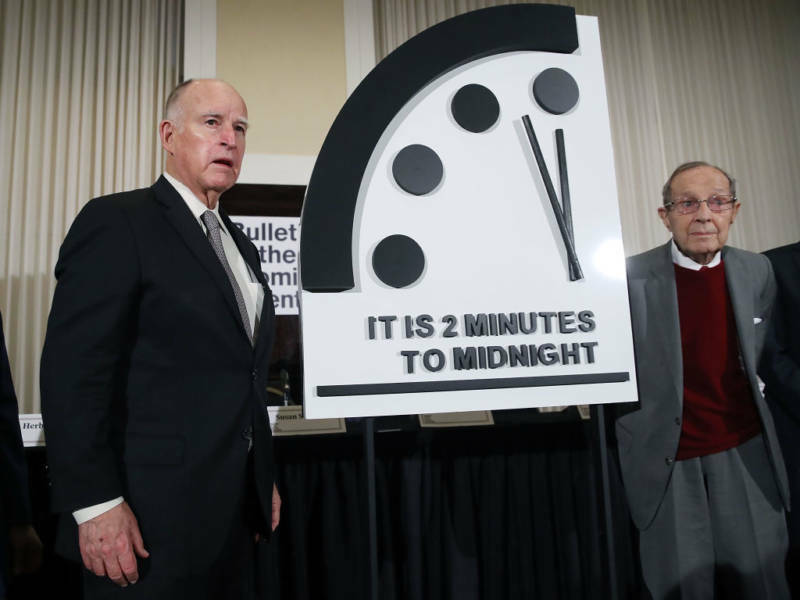 The group updated its Doomsday Clock in Washington D.C. — a metaphorical countdown to midnight, when human-inflicted catastrophe may strike — leaving it frozen at two minutes to midnight, the same time announced in 2017. The only other time the clock has been this close to midnight was in 1953, when the U.S. and the Soviet Union were embroiled in a nuclear arms race. Brown made clear that even though the clock hasn’t inched any closer to midnight, there’s no cause for celebration. The time is set by experts in science, technology and policy who examine the globe’s risk for cyberattacks, nuclear war and climate change-induced disaster. A rise in carbon dioxide emissions, construction of new fossil fuel power plants, depletion of sea ice and the decision to withdraw from the Paris Climate Agreement were some of the climate issues cited for the 11:58 time stamp. The current administration’s mistrust of science was also factored in. The panel acknowledged one positive: the halting of nuclear and missile tests in North Korea, though it didn’t tip the scale. “We’re playing Russian roulette with humanity," Brown said of nuclear proliferation threat, "and the danger, and the probability is mounting that there will be some kind of nuclear incident that will kill millions." And, he added, “…anybody who wants to run for president better deal with climate change because it’s a huge problem."